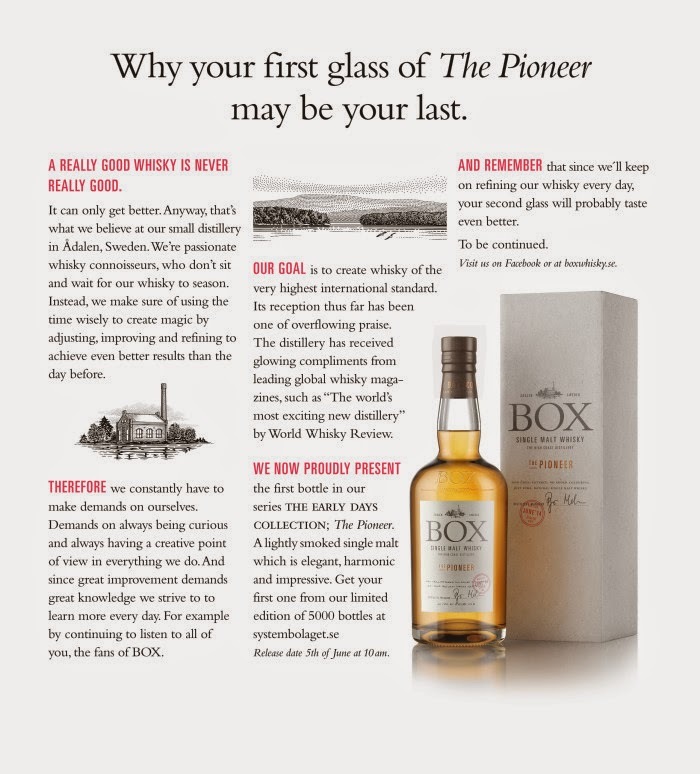 Now, Box is the 6th active distillery in Sweden to release ”fully matured” whisky (3yo as the law requires). 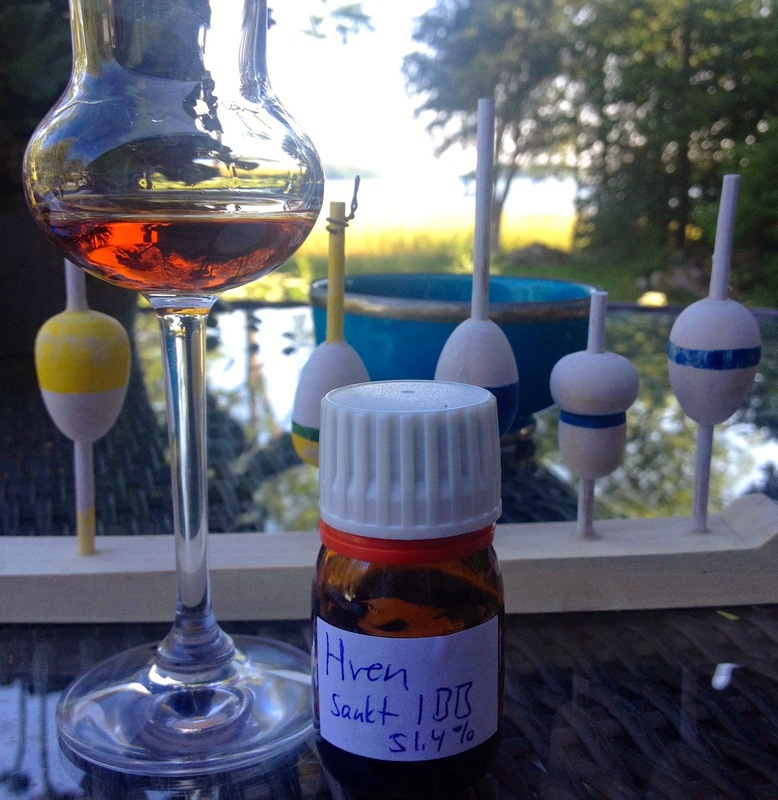 So far I have tasted Mackmyra (but not done any tasting note here on the blog), Smögen and a couple of weeks ago I tasted Hven and they have all been really good so I’m really excited to try whisky from Box! Their name has had a very good international reputation ever since whisky experts around the world for the first time tried their new-make. I’ve never tried anything from Box before so, again, very excited. Box are (and will be) very very very open with their recipies and production process and so they really want us to know how this first bottling is composed, so for swedish followers please take time to read about that here. A short version of the recipie reads as follows: 50% of the whisky is unpeated and matured in 40 litre bourbon casks, 35% of the whisky is 31ppm peated malt and matured in 40 litre bourbon casks, the rest, 15% unpeated and matured in 200 litre bourbon casks and that part has in turn been transferred to 100 litre new charred swedish oak casks. All in all this gave 6508 bottles out of which 5000 went to the swedish state monopoly and sold out in one day (!) Ok, let’s try this one! Mmm! Very nice indeed, definitely the perfect/optimal strength for this flavor and this style of whisky which creates a nice balance. The first thing I pick up is a quite salty and peaty start that really grabs a hold of my tounge. The flavors after that really do delvelope very slowly and almost seamless, good work fellas! We have fudge and soft vanilla, in other words stuff reminding of bourbon maturation, there’s touches of almond paste or maybe more of marzipan actually, a touch of bread yeast in combo with a very very small new spirit-touch, a little spicyness… Medium dry at the very end of the aftertaste, but oh soo calm, and that sugary sweetness from the nose is there on the palate, especially in the aftertaste… Overall on the palate, we have a lot more going on than on the nose, absolutely not anonymous on this side of things, in fact, probably very good for being this young. Extra points for the perfect strength for this particular flavor, nice! 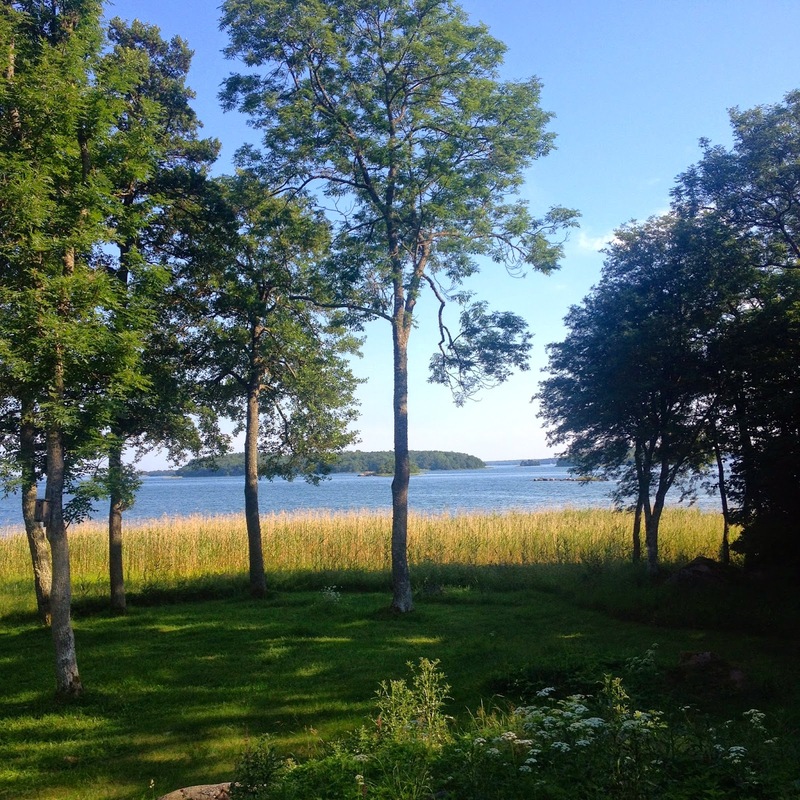 It's an amazing summer here in Sweden, at least where I am, that is in the archipelago on the east coast of Sweden not far from the town Norrtälje! 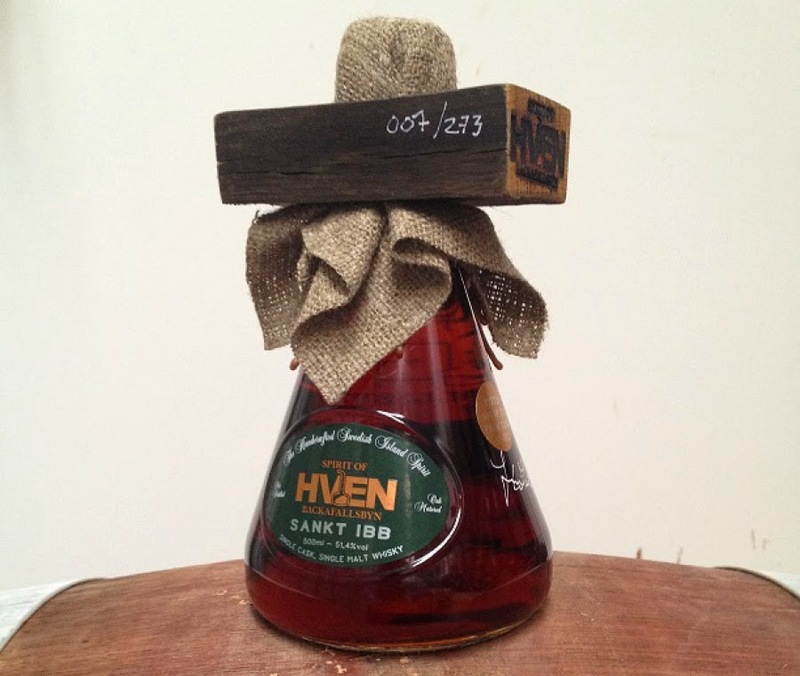 "Sankt Ibb, cask 11-217, is made from barley grown on the coordinates 55°91’N, 12°69’S just outside the distillery. The barley was malted in our pilot plant and the kilning was done with Chinquapin oak from old casks and locally harvested sea weed. After 120 hours fermentation with two different yeast strains, specifically grown to embrace the fruity phenolic character, the wash was gently distilled and the heart was carefully collected. The spirit was laid to rest on a high toast, high char cask made of air dried Quercus Muehlenbergii harvested on the shores of Meramec river. After given its initial character the spirit was transferred to a cask made from air dried Quercus Petraea harvested outside Moulin’s (Allier). This cask was previously used to enhance one of the most rewarded Cabernet Sauvignon/Merlot wines from Italy.This whisky is bottled at the site of the distillery at cask strength 51,4 vol%, without any carbon- or chill filtering, no colour or additives. Completely natural, as should be". Ok, let's see what we got here! Wow! This is a dark one, not only in the apperance and the amazing color that is but also on the nose. The first thing I got was a kind of mix of newly ground coffe and arrak almost rhum-esque, there is also dark raisins. At a more deep nosing we also have something that seems to be a great deal herb-ish, in the 2nd or 3rd layer maybe going towards the swiss spirit ’Unicum’ which definitely is there for the first time in a whisky for me… reminiscence of a dark (food)cellar? Just a touch of wood/barell that moulder away (but in a good way of course), in that fragrance we also have a something really citric, like lime or lemon peel. Surrounding all this is a very special dark smoky-ness in a style I’ve never felt before, must be the special peating… Nice! As you understand this is very interesting stuff indeed and I really have no idea what to expect on the palate, let’s see! 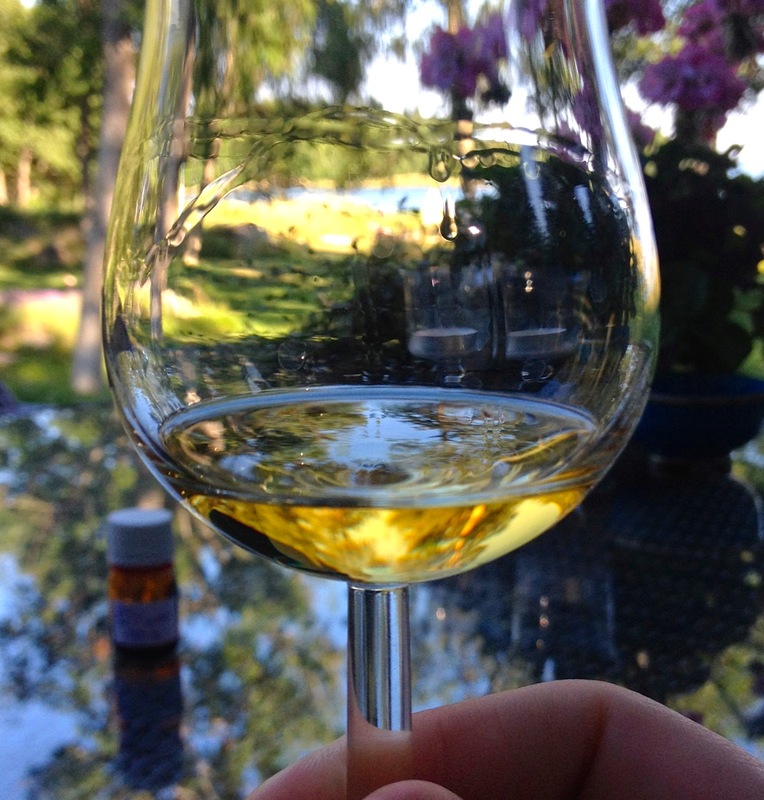 To sum up, absolutely beautiful and a wonderful experience to taste a swedish single cask whisky! 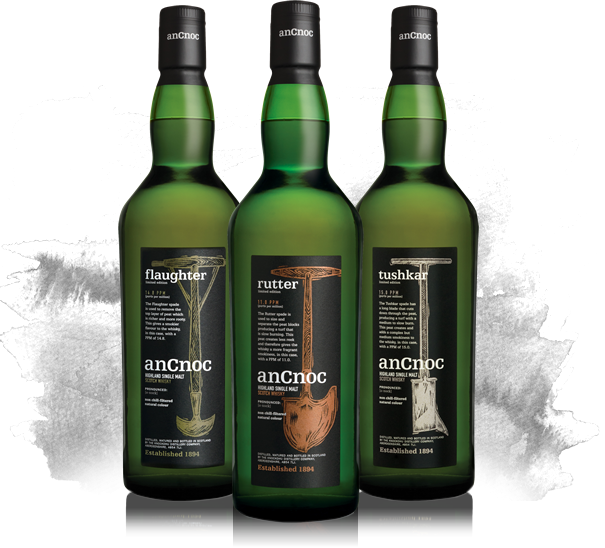 A peated trio from anCnoc! Friends! As you might remember it was not that very long ago since I reviewed the ’tushkar’ from the newly released peated range of anCnoc. Now if you never did read that post please check it out here to see what I thougth about the ’tushkar’ and please also take part of an interesting post on the whole range and some story behind it here. So, starting of with the nose of the rutter it does seem a bit younger than the other two (although it probably isn’t…) and has a lot of liquorice in it… quickly nosing the other two it seems to me that the flaughter is the ”most mature” or maybe it’s just more balanced? Peat-wise on the nose the rutter and the flaughter are quite alike in profile indeed, both are very damp; wet stones, a moist kind of peaty-ness and quite forrest-y, but the flaughter has a bit more salt in the peat and is a bit more closed… picking up the glass with the tushkar I do find it to be a lot softer on the peat than the other two, which is quite strange indeed (since it’s supposed to be the peatiest of the three) but that might depend on the fact that the samplebottle has been half-full since the first time I tasted the tushkar. The tushkar also by far has a lot (yes a lot) more vanilla on the nose than the other two… there is also something a bit fire-y on the nose of the tushkar when you manage to get beneath the peat-layer Okey, let’s have a sip! Starting of with the rutter is a very pleasent surprise peat-wise, not at all damp and ”moist” as on the nose but rather a fair part of saltyness and at least a fair part of punsch/attack, not very dry but still dry, which could mean medium dry ;) a mix of sweet liquorice and milkchocolate in the distant aftertaste. 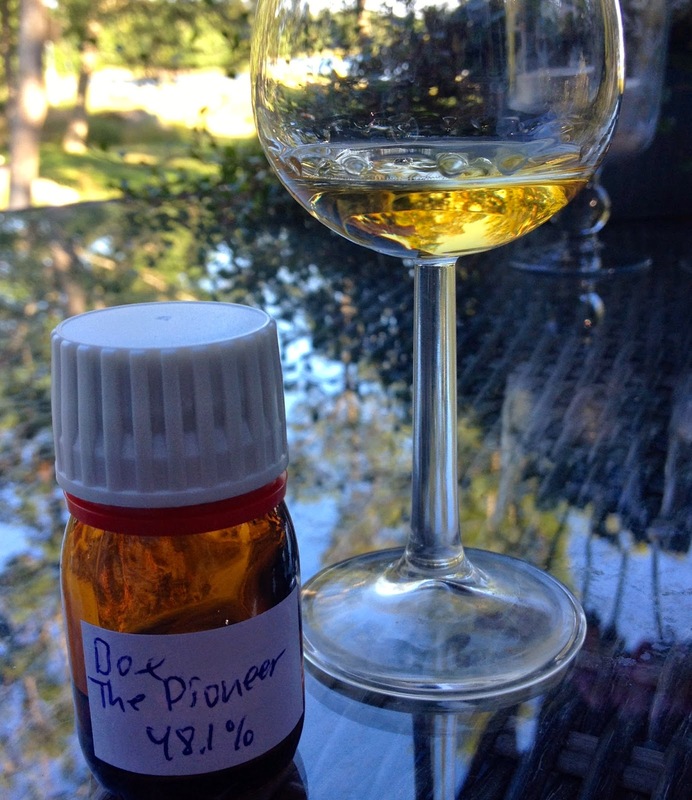 Moving on to the palate of the flaughter we have… (tasting…) mmm! Very nice, a lot more saltyness! Mmm, very nice, not nessecarily peatier but the saltyness might make it seem that way… the milkchocolate is not there in the same way, but overall definitely more of everything and thicker mouthfeel compared to the rutter. moving on to tushkar I get… oh yeah! This is a boosted version of the previous for sure, more of everything, more salt, more peat, and oooh! I actually get someting I’ve never felt before in a whisky, vanilla infused with coconut milk! Or maybe it’s the other way around… very good! 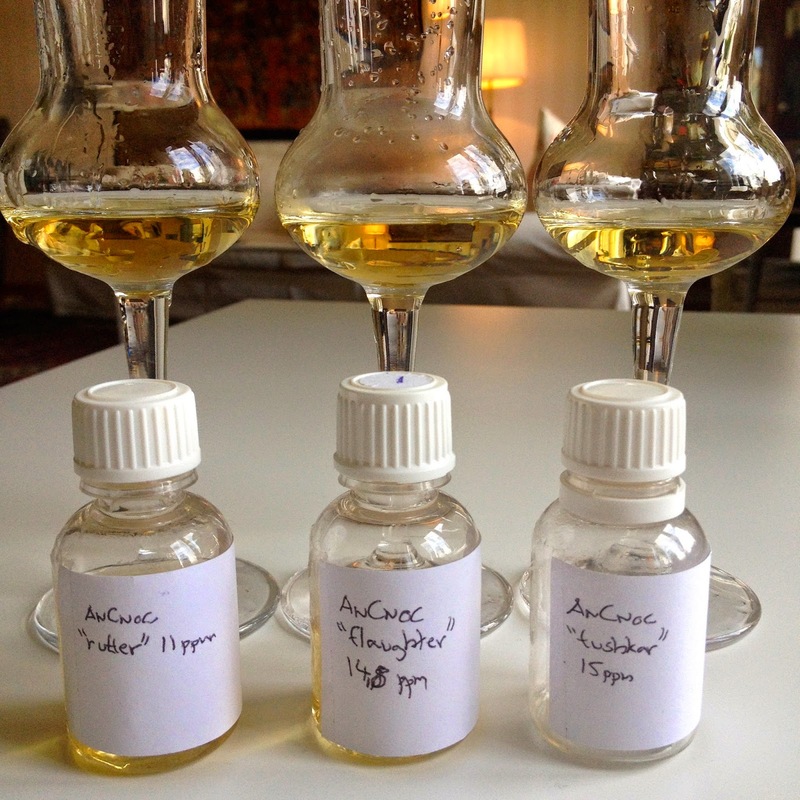 Wow, I really have a nice mix of different peat-styles on the aftertaste now… beautiful and such a treat to be able to compare these three side by side. As you know by now the tushkar is exclusive to the swedish market, which is a treat in itself, but if you ever do get the chance to compare all three, don’t miss out! Swedish fans actually will be able to compare all three since rutter and flaughter were released at the monopoly store today (although in very limited quantities), so do check it out here and here! A big thanks to David at Berntson for sharing these samples to me during the Gothenburg Beer and Whisky festival! Sláinte!